This watch face is one and one-half inch long. It has crystals embedded all around. It has one hole hidden on the ends. All of these watch faces are very special and hard to source these days. The watch face is designed to be used with beadwork. This watch face is approximately one inch across the face. It is so unique in that it has many colors of crystals embedded around the face. It has two holes per side which you can see here. All of these watch faces are very special and hard to source these days. 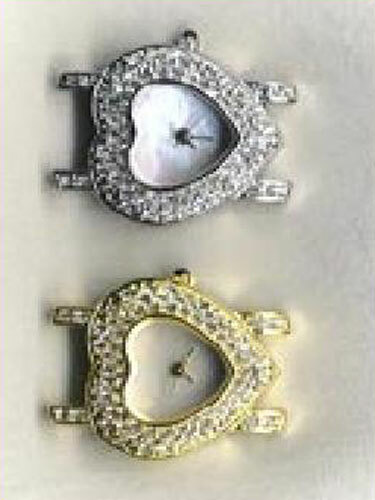 The watch face is designed to be used with beadwork. This watch face is one and one-half inch long. It has crystals embedded all around the face. It has one hidden imbedded hole on each end. All of these watch faces are very special and hard to source these days. The watch face is designed to be used with beadwork. 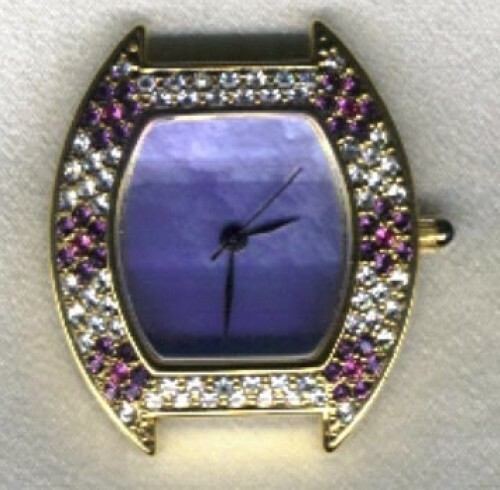 This watch face is approximately one inch long including the crystal extension. It has large crystals embedded all around the face. It has two hidden holes on each end. All of these watch faces are very special and hard to source these days. 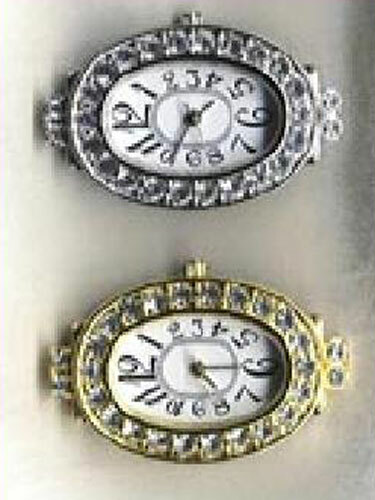 The watch face is designed to be used with beadwork. This watch face is approximately one inch long. It has crystals embedded all around the face and three baguettes on each end. It has one very obvious hole on each end. All of these watch faces are very special and hard to source these days. 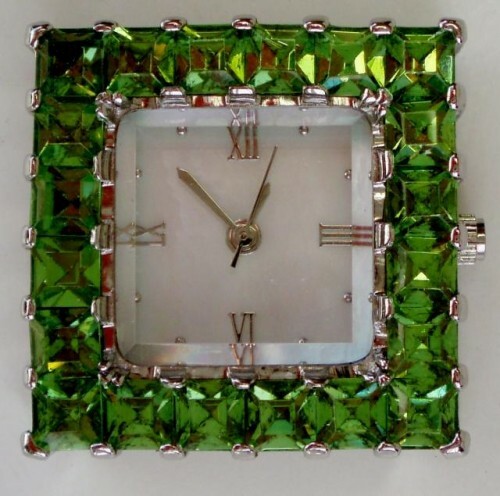 The watch face is designed to be used with beadwork. The heart portion of this watch face is approximately one inch long. The holes extensions on each side add an additional one-quarter inch of length. It has crystals embedded all around the face and on the hole extensions. This is a most charming watch face. All of these watch faces are very special and hard to source these days. 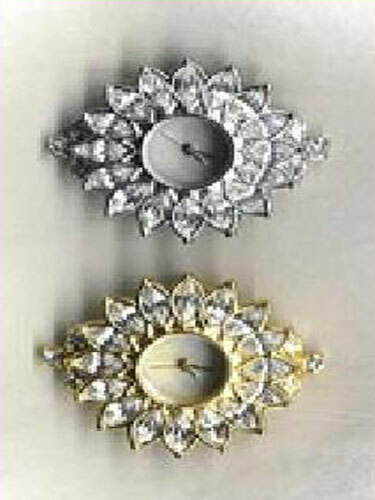 The watch face is designed to be used with beadwork. This watch face is one and one-half inch long including the hole extensions. It has crystals embedded all around It has crystals embedded all around. It has one hole hidden on the ends. All of these watch faces are very special and hard to source these days. 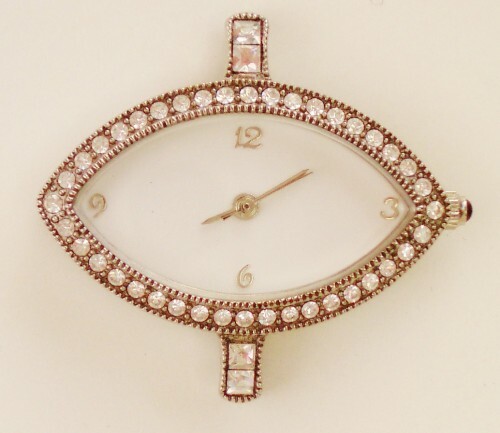 The watch face is designed to be used with beadwork. This watch face is one and one-quarter inches long. It has crystals embedded all around the face and two additional rows of crystals on each end. It has a semi-hidden hole on each end. All of these watch faces are very special and hard to source these days. 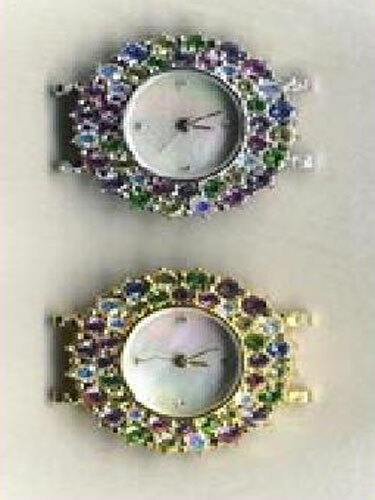 The watch face is designed to be used with beadwork. This watch face is one and one-quarter inches long. It has oval crystals embedded all around the face (I think this one looks like a star burst) and one additional row of square crystals on each end plus one more to hide the hole. It has one hidden hole on each end. All of these watch faces are very special and hard to source these days. 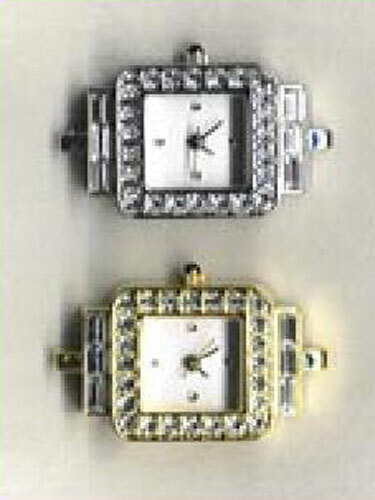 The watch face is designed to be used with beadwork. This watch face is approximately one and one quarter inches long and three quarters inches wide. It has many small crystals embedded all around the face. There are two crystal covered holes on each end. These very special watch faces can not be restocked. I have one in each color of this model. 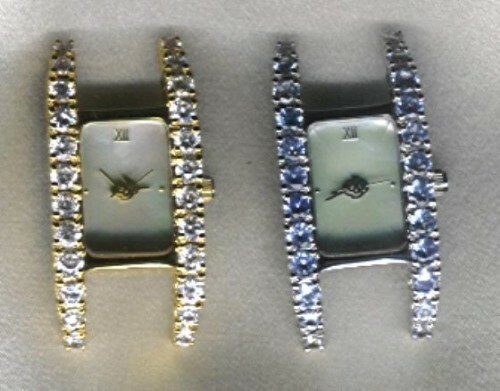 This watch face is approximately one and one half inches long and three quarters inches wide. It curves on the surface and has many small crystals embeddedalong the edges. There are two drilled holes on each extension. 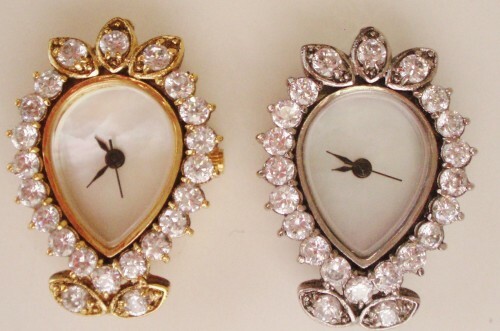 These very special watch faces can not be restocked. I have one in each color of this model. This watch face is approximately one inch square. It has blue crystals all around the face. There are two drilled holes on each end that are recessed. These very special watch faces can not be restocked. This watch face is approximately one inch square. It has green crystals all around the face. There are two drilled holes on each end that are recessed. These very special watch faces can not be restocked. 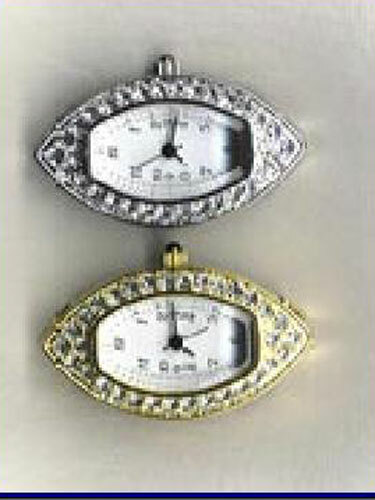 The tear drop portion of this watch face is approximately one and one quarter inches long. There is a hole on each side that is hidden by two crystals. It has crystals embedded all around the face. This is a most charming watch face. All of these watch faces are very special and hard to source these days. 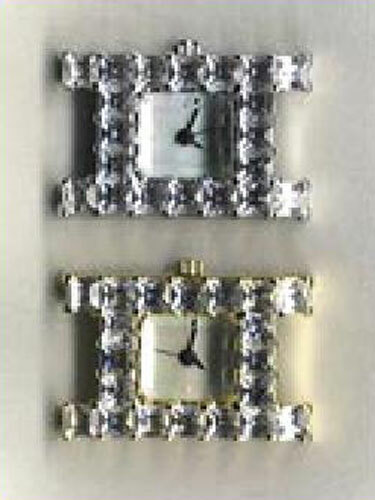 The watch face is designed to be used with beadwork. The tear drop portion of this watch face is approximately one inch long. There is a hole on each end that is hidden. It has crystals embedded all around the face and on the hole extensions. This is a most charming watch face. All of these watch faces are very special and hard to source these days. 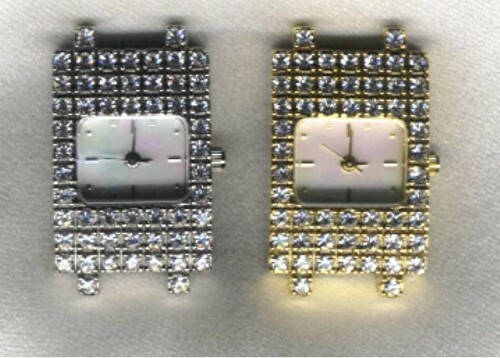 The watch face is designed to be used with beadwork. 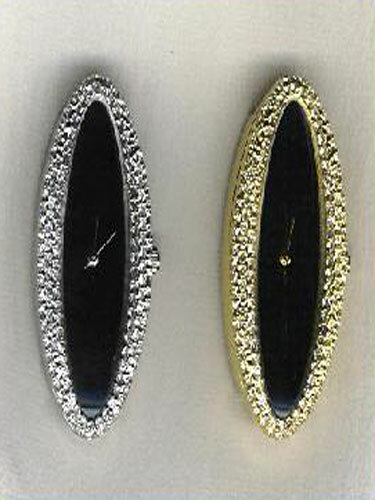 The oval shape of this watch face is approximately one and one quarter inches long and one inch wide. There are two holes on each end. 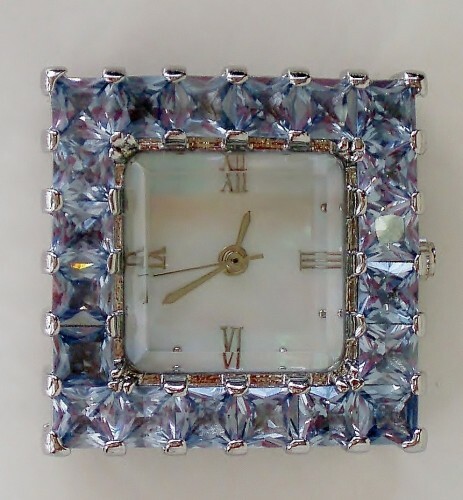 It has crystals embedded all around the face in a pleasing pattern. This is a most charming watch face. All of these watch faces are very special and hard to source these days. 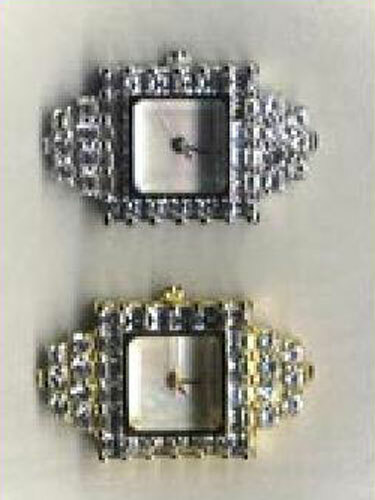 The watch face is designed to be used with beadwork.